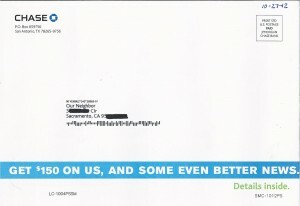 Slick self-mailer – Questionable offer. 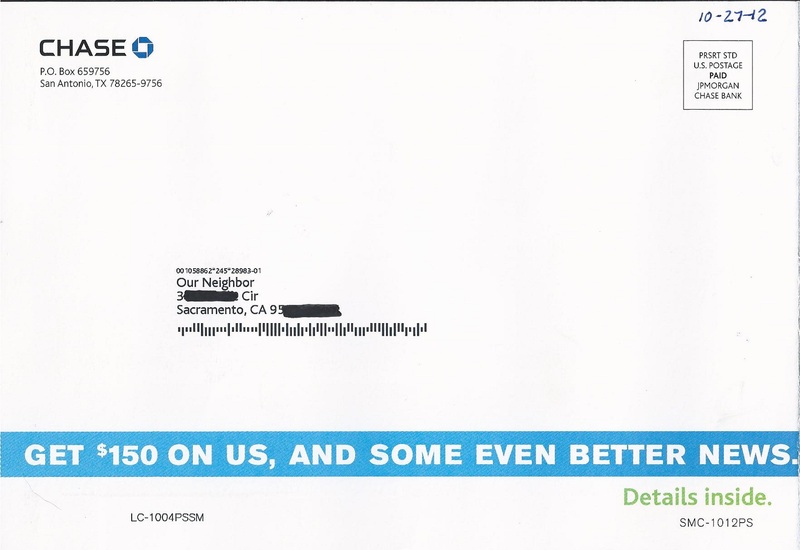 I disagree with the marketing folks at Chase Bank! 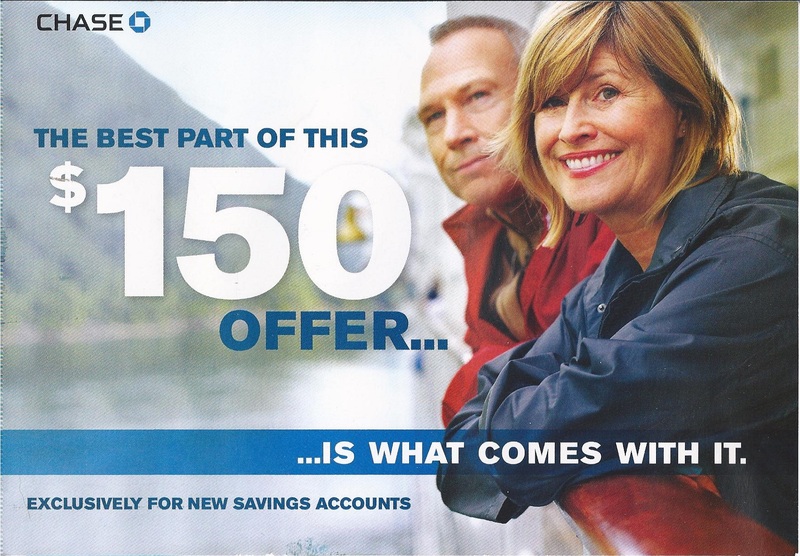 The best part of their current direct mail offer is actually the $150 Cash Bonus – not what comes with it. Let’s start with the personalization side of the 9″ x 6″ self-mailer shown below. Note, it was not personalized but sent to “Our Neighbor.” Normally, this wouldn’t bother me as it covers those households where a recent move has occurred. But given the nature of the “even better news,” it would have been more appropriate had it been addressed to an actual person living at the address shown on the self-mailer. The big promise appears on the front cover of the self-mailer shown below. My first reaction, and most likely that of most other recipients, is what could possibly be “even better” than a $150 cash bonus. Now for our first look inside this self-mailer. Here’s the left, inside panel. Note the headline about the “good” part of the offer. 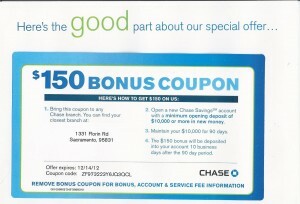 A tipped-on card repeats the $150 cash bonus from the front cover and includes the qualifying criteria. 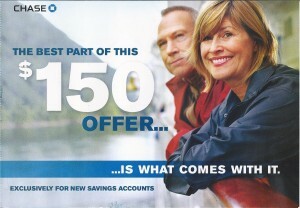 Here’s the right, inside panel where we are told about the “best part” of this special offer. Turns out the “best part” has been dragged out of the “obsolete marketing ideas from the past” file and resurrected for this mailing. 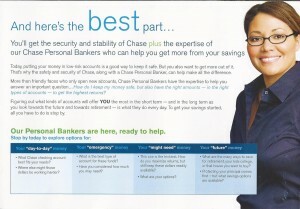 Chase promises to provide you with a Chase Personal Banker. 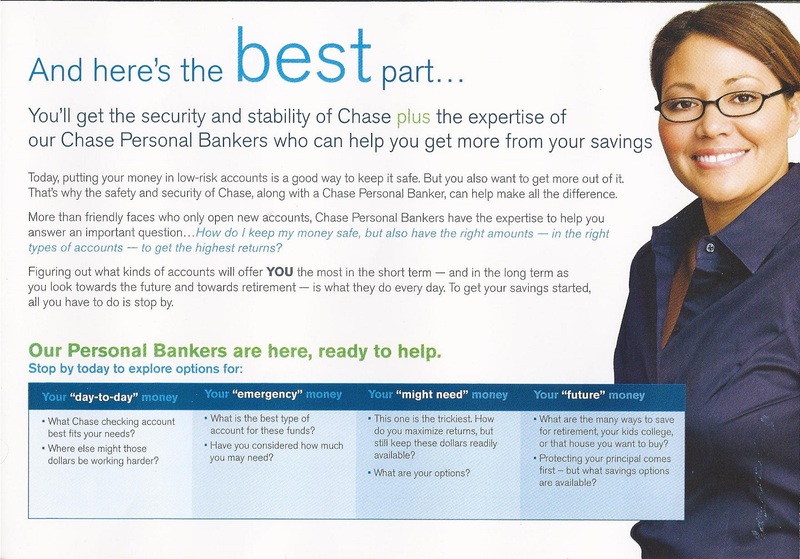 First, does any consumer really believe that by opening this savings account you’ll be assigned a personal banker – one who will always be there should you visit the branch, call the branch, or contact the bank via the Chase website? Given the fact that the majority of consumer banking today is done remotely, the Personal Banker idea is a relic from the past. To me, this part of the offer simply doesn’t pass the snicker test. 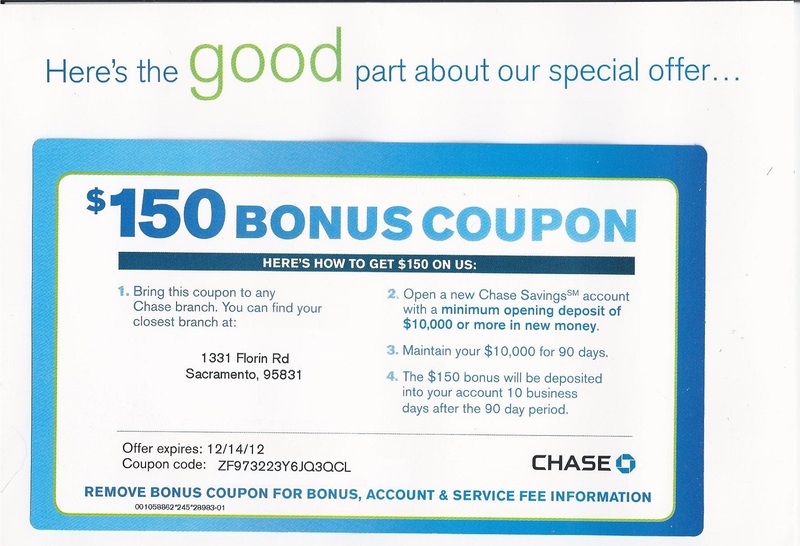 No, the best part of this offer is the $150 cash bonus for those consumers willing to open a Chase Savings account with $10,000 or more and leave it on deposit for at least 90 days before the cash bonus is paid. By the way, I just checked the bank’s website and discovered that as of 10/29/12, Chase is paying a robust 0.01% rate of interest on the $10,000 balance in this savings account. Basically, you’re loaning Chase your money for free. At a minimum, the $150 cash bonus helps offset the paltry interest earned on your $10,000 – at least for the first year. I’m still shaking my head over this feeble attempt at convincing prospects that there is something even better than the $150 cash bonus. I’m not sure which part of his quote is applicable here. The marketing folks behind this special offer are most likely betting on the middle part – fooling all of the people some of the time. It makes me wonder if this special offer doesn’t work, what will they come up with next time.